One of the most populous and vibrant cities of the United States is the ultra-modern and exuberant state of Chicago which is nestled on the gorgeous shores of Lake Michigan. The glistening steely skyscrapers, posh hotels and residences, fine reputed restaurants, innovative contemporary architecture and a mecca of fashion, visitors can’t get enough of it!. The buzzing downtown Chicago is also home to the commercial district of Magnificent Mile where visitors will be pampered by the upscale markets, shops, hotels, restaurants, you name it! Discover the breathtaking and intimidating Wrigley Building skyscraper and the John Hancock Center where one can cherish dining on the rooftop while basking in the panoramic city views. 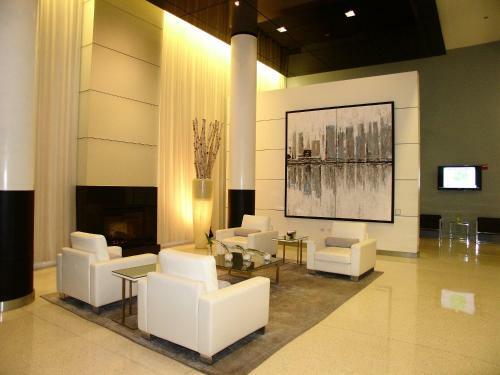 The downtown offers discerning visitors with a range of luxurious hotels and if you are looking for those with a kitchen then consider our list below, with information on hotels with kitchens, in Chicago. The charming Dewitt Hotel is an ideal accommodation option to enjoy a bit of luxurious indulgence. The boutique hotel lies two blocks away from facilities such as restaurants, and shopping centers on Michigan Avenue’s Magnificent Mile. Its studio apartment is styled with opulent element ranging from the glossy hardwood floor to its chic bedroom and spacious living room equipped with comfy sofas. Its kitchen area is set in a modern style where guests will be able to use kitchenware and appliances such as a microwave, refrigerator, a stove and coffee making facilities. In addition, there is a lovely dining area that’s fitted with a table and chairs. 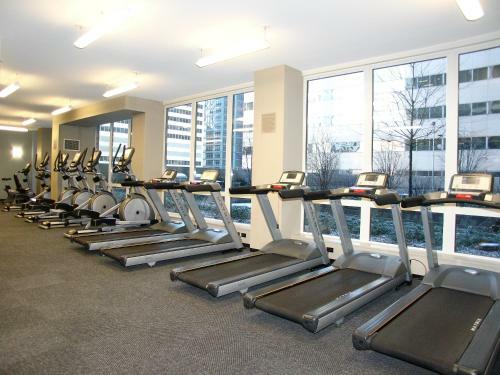 Hotel amenities include a fitness center with a steam shower, spa facilities, and free Wi-Fi connection. The exuberant Central Loop Hotel provides a sophisticated staying experience where style and comfort have been combined harmoniously to cater to the most discerning guests. Located some blocks away from the Art Institute of Chicago and Millennium Park, this decadent hotel offers guests with a wide option of accommodation which suits everyone’s preference. If you’re someone looking for a chic and luxurious accommodation with a modern kitchenette, then choose the airy one-room suite that’s set in a bright light tone. Every little corner of this accommodation emanates elegance and comfort. There are custom-designed furniture, a work desk with an ergonomic chair, a smart TV, a mobile room lock, an equipped kitchen, and an en-suite bathroom with amenities. To top it off, there are complimentary espresso and Wi-Fi. The immaculate River Hotel is situated in the lively downtown Chicago, ideal for holidaymakers who wish to experience the local culture, refine cuisine and learn about the history of this city. The property offers snug and ravishing bedrooms which are awash with natural light. 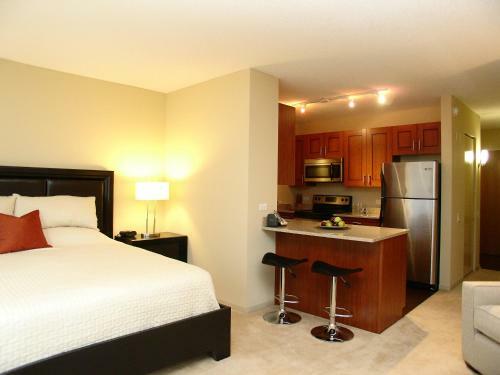 Room amenities consist of premium beds, quality furniture, flat-screen TV, and a kitchenette. The hotel also gives its guests warm hospitality and high standard services. 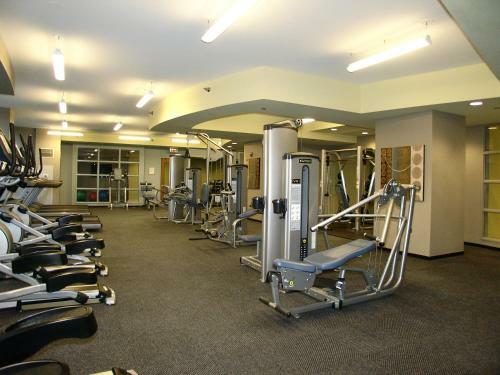 Guests can use the fully equipped gym to keep up with their fitness routine. This posh hotel is smack in the center of the Chicago downtown where guests will have the chance to visit major attractions such as the iconic Millennium Park. The hotel offers contemporary chic apartment style accommodation. The interior of the studio is spacious and adorned with a vibrant carpet floor and sleek hardwood floor. Amenities include coffee making facilities, cable TV, couches, a working desk, and a fully equipped kitchen with furniture. 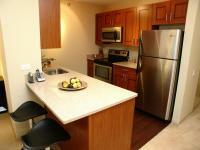 Kitchen amenities are comprised of a microwave, a refrigerator and, a toaster. Raffaello Hotel emanates sophisticated elegance at its best. This high standard hotel offers opulent accommodation settings with premium amenities. This four-star boutique hotel is nestled in the Michigan Avenue and it features rooftop terraces where guests will be able to contemplate remarkable lake and skyline views. Enjoy the warm hospitality while staying at this upmarket hotel’s European-style guestroom. The guest rooms are equipped with premium bedding, a TV with satellite channels, an en-suite bathroom, and a kitchen which comes with a microwave, and a refrigerator. There are snug sofas and a mini-bar as well. Avid vacationers who wish to explore the city center and its iconic attractions such as the State Street and Magnificent Mile at Michigan Avenue should consider staying at the convenient Hampton Inn & Suites. The hotel provides guests with several staying options, and one of which has kitchen amenities including a bedroom, and an en-suite bathroom. 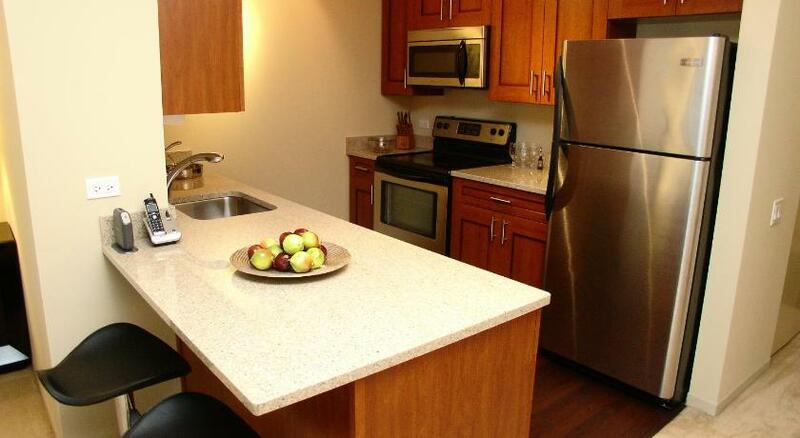 Kitchen amenities are composed of a microwave and a mini-refrigerator. The property also has a fitness center, an on-site restaurant, and it offers complimentary Wi-Fi access. The quirky, stylish-chic FieldHouse Jones Hotel has a cozy and vibrant interior decor. Its remarkable grey hardwood floor adds character to its interior design. One of its kind, the hotel provides guests with a unique lodging experience in a totally artistic urban setting. 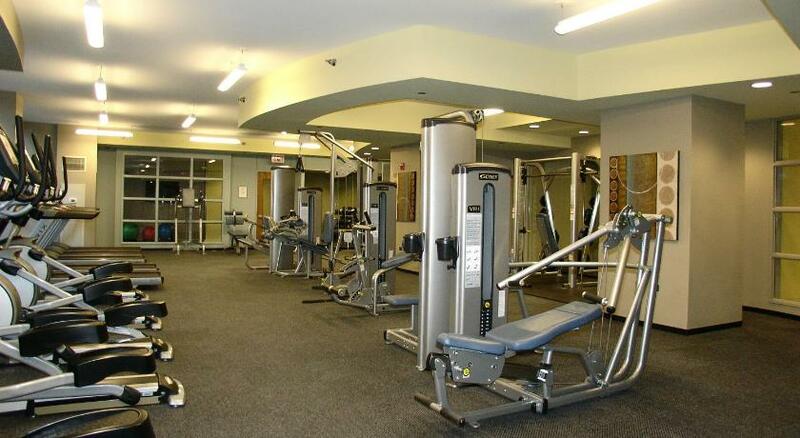 Conveniently located in downtown Chicago, the hotel offers guest rooms with a private bathroom and a kitchenette. Amenities include a lounge and coffee bar area, an on-site restaurant and a 24-hour front desk service. Address: 312 W. Chestnut St. Located on North Michigan Avenue in the heart of downtown Chicago, this decent-looking home-style hotel apartment offers a spacious interior to families on vacation. The interior setting of the apartment is snug, charming and filled with natural light. Guests will have the option of choosing from one or two-bedroom suites. The different units consist of a bedroom, a living space, a private bathroom, and a fully equipped kitchen. The upmarket Trump International Hotel & Tower Chicago invites discerning guests to indulge in an extravagant sojourning experience. The hotel displays luxurious suites where guests will be able to enjoy the stunning skyline. The suite has a lavish bedroom, an indulging deep soaking bathtub, and a kitchenette with basic amenities. The property has facilities such as an on-site restaurant, a swimming pool, an indoor dining room and bar, including a seasonal outdoor terrace with iconic city views. 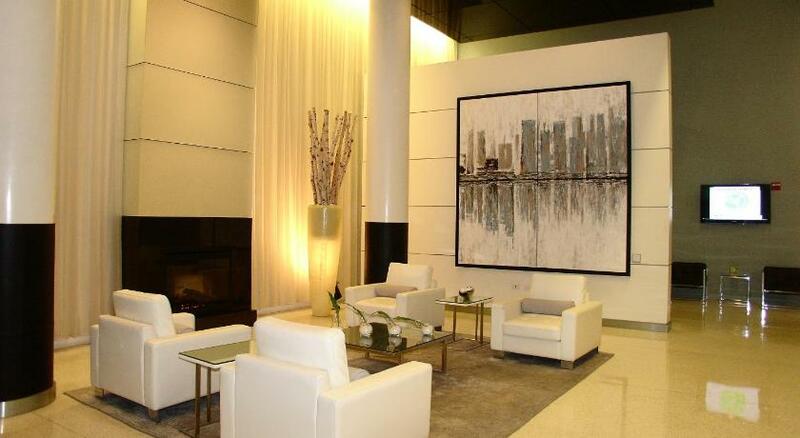 This contemporary-chic apartment hotel is located 10 minutes from the iconic Millennium Park. It boasts chic apartments awash with warm sunlight. The interior of the apartment is stylish, chic and elegant. There are a spacious bedroom, an en-suite bathroom and a kitchen area where guests can use the basic amenities for their convenience. Enjoy staying in upmarket neighborhoods of the Windy City where you will be exposed to some of the popular attractions, fine cuisine, and awe-inspiring city view. Book your hotel with a kitchen and relish the ultimate comfort. Please note that the term kitchen and kitchenette have been used synonymously, and may not be differentiated in this article on the basis of their technical differences, especially size.